At the moment I can't think straight as our house is a tip. Our sun room is being gutted so is out of bounds, our dining room has disappeared under stacks of books and there are piles of homeless stuff everywhere. I know it'll be worth it in the end though and I am very grateful to have a 'good-with-his-hands' husband - I'm just wishing we hadn't picked the school holidays to get started on this! Roll on next monday! 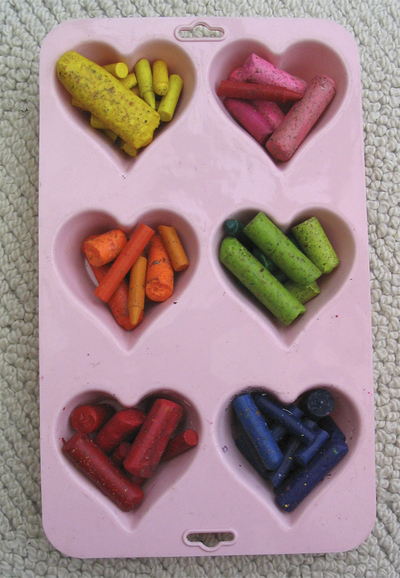 ...yummy new crayons which almost look good enough to eat. We had great fun and recycled some cruddy crayon stubs into lovely new ones. 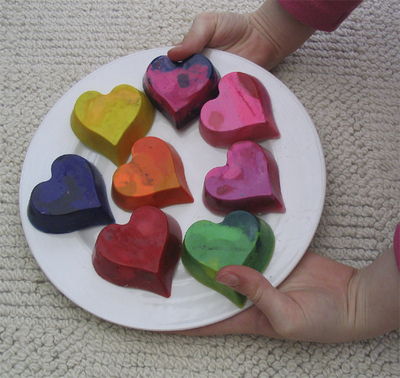 I'm so chuffed to have found a good use for my silicone cupcake mould because the cakes I made in it did not emerge as heart-shaped - they came out in bits! Goodness, I'm completely overwhelmed by the number of comments in the 200th post draw. It's lovely to know that the little cotton rabbits and I have so many friends out there! Thanks for all of the lovely comments that you left - I've really appreciated reading them. So, who won, who won?!! 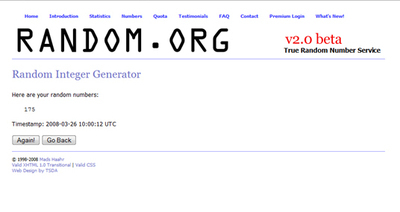 I threw it open to atmospheric noise and a website that uses this to generate true random numbers. So Congratulations to c. Rachel and many, many thanks again everyone for taking the time to leave a comment. I can't believe this has come around so quickly. 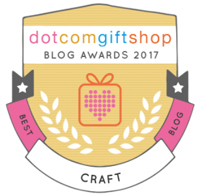 When I first started I wasn't sure how long I'd stick at blogging but visiting other blogs and reading all of the wonderful comments that people leave here has become a really important part of my day. Thanks so much for visiting, leaving comments and for the encouragement and support that you offer me. To celebrate I'd like to give away a toy at random so if you'd like to win it please just leave a comment below (just say Hi if nothing else comes to mind but be sure to leave a contact email). I'll leave this post up for the next week and then use a random generator thingy to pick a winner on Wednesday March 26th. 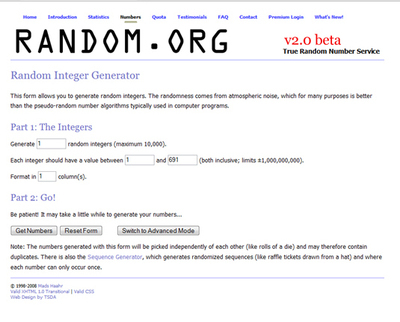 The winner can then choose what regular sized toy they'd like me to make for them. 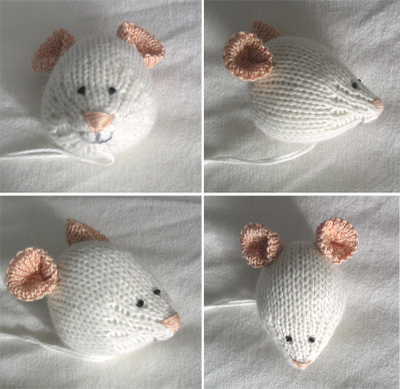 I've been playing with mice again this week and have made another prototype head with a pointier nose and completely pink ears. I think I'm happy with it at last, so mice are now on the menu! Anyway have a wonderful Easter - eat lots of chocolate and don't forget to leave a comment below if you'd like to enter my giveaway. 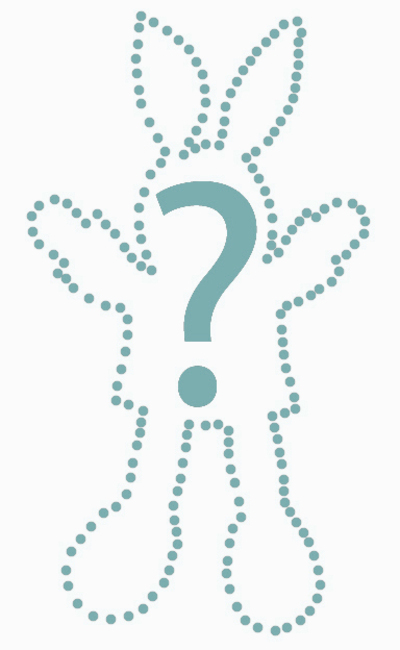 an explanation for the mysterious lack of toys! Thanks so much for the lovely comments on the previous post. The 'Holland' piece has obviously been a source of comfort for a lot of people - I'm certainly very glad it was written. Thanks too for sticking around while I was 'off blog'. I'm up to date with my paperwork now, which is a nice feeling, however fleeting!! 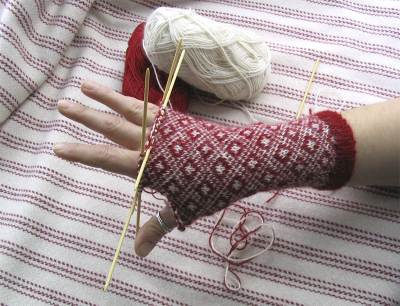 I even managed to squeeze in some knitting time - not toys but a pair of Eunny Jang's wonderful Endpaper mittens. 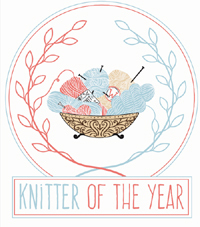 Taking this break from knitting toys has given me a bit of breathing space to consider where it has all evolved to. For the last year I've been going at the toy knitting like there's no tomorrow, but of course there is and this knitting pace is not sustainable if I want to continue to enjoy what I'm doing. For me, that is the one true aim - making the toys is my 'thing' and definitely an antidote to raising a severely autistic child. 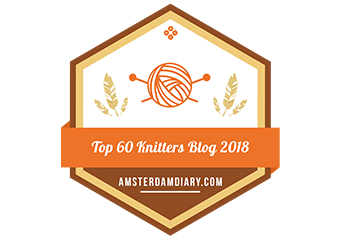 Since starting this blog I've had so many lovely comments about the things I make, all of which I deeply appreciate and treasure and I guess I felt that I owe you all an explanation and an apology for the current lack of toys. So I'm sorry that there will be no Little Cotton Rabbits for Easter this year. Instead I'm building up a stock which will mean that there will always be a slow and steady trickle going into my shop even if I have a knitting break now and then. I've also been pondering my patterns again but I'm not ready to release any yet so I've put a new link to some toy patterns from other designers - including Ysolda Teague who designs toys with the most beautiful shaping and Fuzzy Mitten who has a great range of different creatures. See the list below on the left (I'll add more in future). 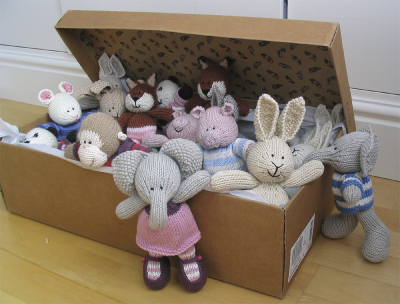 It's not all bad news from here though - Edgar and his friends are waiting in their box (in fact they keep trying to break out!) and will pop into the shop in early April and I'll aim to have a new batch every 4 - 6 weeks following that (barring school holidays of course!). 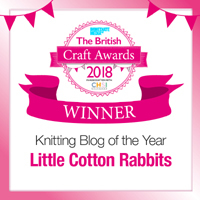 Also this is my 199th post and so in keeping with tradition I'm having a giveaway in the next post - a chance for someone to win a Little Cotton Rabbit of their choice. To enter the draw please pop back and leave a comment on the next post. Thanks for all of the kind comments about my prototype mouse - I think bigger ears and a pointier nose is the next thing to try out. I also wanted to say that if you fancy revisiting some of the fun songs from your childhood there is a great CD with lots of them on - Nellie the Elephant, The Runaway Train, The Ugly Duckling, The laughing Policeman... and many more although sadly not the Old Amsterdam song. It's called Hello Children Everywhere by EMI records. I landed in 'Holland' four and a half years ago when we had a diagnosis of severe autism confirmed for our 2 year old son. These days I have moments when I forget that I ever wanted to go to 'Italy' but most of the time I'm still struggling to get to grips with the language and different customs of 'Holland'. 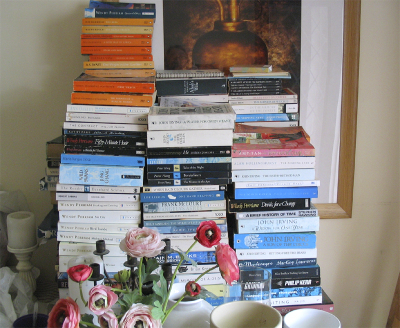 Sometimes it needs quite a lot of hard work and some new guide books and I'm at that point right now where I need to go find a quiet corner and read for a bit in the hope of better understanding where I find myself. I've also got lots of paperwork to fill in for his annual statement of educational needs review. So I'm off for a little break from blogging (just a week or so) to give myself time to concentrate fully on the task in hand.